Remember Facebook Home? It's the Android overlay that puts the social network front and center, but today it was feeling hospitable and decided to let others walk through its front door. 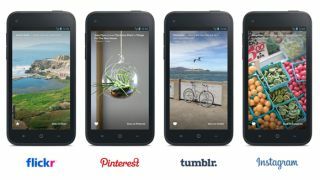 One of Facebook Home's selling points is that users can swipe through the lock screen to see photos from their Facebook news feeds, and starting today posts and pics from Instagram, Pinterest, Tumblr and Flickr can be viewed there as well. "Today you can view more of the content you care about on your lock screen," Facebook Engineering Manager Tom Alison wrote on Facebook's brief announcement message. "When you wake up your phone, swipe through photos and posts from Flickr, Pinterest, Tumblr and Instagram, in addition to Facebook," he continued. The feature will begin testing within the Facebook for Android beta program before heading out for all. According to Facebook, users need only connect their accounts for the other networks with Home to begin seeing items from those services on their lock screens. Users can change what content appears on the lock screen in the settings menu. "Connecting apps to Home is just one more way to see the content that you care most about the moment you wake up your phone," Facebook Product Designer Francis Luu said in a video explaining the new features. This addition to Facebook Home was promised last month, when Facebook creator Mark Zuckerberg revealed that Instagram and other services would soon be added to the Home lock screen. Zuckerberg also admitted that users have not been quick to embrace Facebook Home, but he believes that will change "over time." That sentiment has been repeated by others at Facebook, including Facebook COO Sheryl Sandberg, who said last May that Facebook Home's journey to success "will be a long road."